In line with the new "SHINKA 2019" Medium Term Business Plan announced in May, our businesses have been classified into “core business,” “growth business,” and “new business” and we are moving forward with the initiatives matched to their respective positioning and assigned roles. 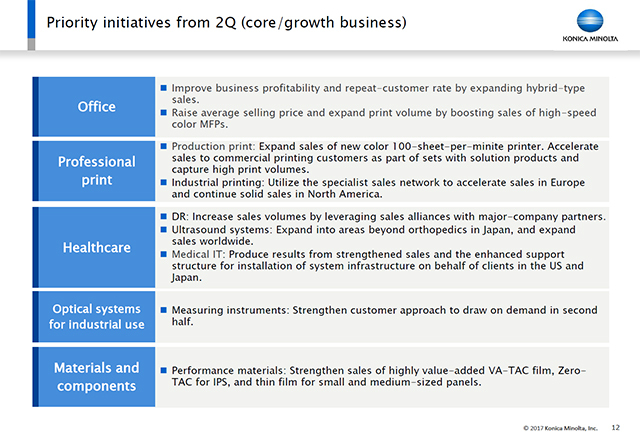 This slide shows the initiatives for the "core" and "growth" businesses. In the Office Business, I have already given an explanation regarding the expansion of hardware sales, and we will continue to strengthen hybrid-type sales in which hardware is combined with IT services. In the production print business unit of the Professional print segment we launched a new 100 PPM model, and this will not be sold as a stand-alone product but instead it will be bundled with solutions. By expanding sales to commercial printing customers we will open the way to higher print volumes. In Healthcare Business, we intend to intensify our efforts to develop the US business. Our approach will be to focus on extracting results from DR and medical IT. In measuring instruments, in the Optical systems for industrial use segment, the progress of development in the two companies acquired has been steady, and we will strive to further accelerate the positive momentum of the first quarter. In the performance materials business unit of the Materials and components segment, price pressure is intensifying, but we will increase our sales of the high value-added VA-TAC, Zero-TAC for IPS and thin film products for small and medium-sized panels.